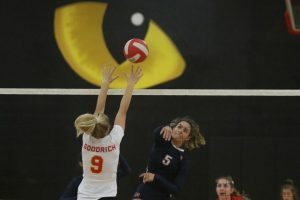 CORONA: The Lady Wolves Varsity Volleyball team (16-14) traveled to Corona on Tuesday to battle with Panthers. The Lady Wolves were victorious in 3 sets 25-19, 25-9, 25-22. The Lady Wolves dominated the net with 10 blocks, led by Senior Sarayah Duffy who had 6. King had a balanced offensive attack led by junior Outside Hitter Alexa Kleven with 7 kills, Junior Kourtney Stark and Sophomore Delaynee Bushay also had 4 kills each. Delaynee also was active defensively as she and Senior libero Taylor Edwards scooped up 8 digs each on the night. “There were quite a few role players on our team that were key contributors tonight which shows the depth of our team. Corona is a much improved team and challenged our players tonight to play well” shared Coach Duncan. The Lady Wolves JV team remain undefeated on the season as they beat Norco 2 sets to 0. The Lady Wolves Freshmen team remains undefeated in league play as the won 2 sets to none.